As part of UC Santa Cruz's women's volleyball team, Kaitlyne Fisher was used to being the underdog. The team arrived for games wearing hand-me-down sweats and carrying years-old equipment bags. They told jokes and shouted strange cheers like "ride the bodacious wave" during matches. So when the unconventional, and underfunded, team came up against the No. 4-ranked Elmhurst College of Illinois, most people expected the Slugs to lose. Instead, the team won the match in straight sets. The victory helped land UCSC an at-large berth in the NCAA national championships in Texas. It was a first for UC Santa Cruz women's volleyball. "For these kids, it was about not being afraid to dream and learning how to deal with adversity," said first-year coach Dwight Combs who led the team to a 20-6 season. "It was failing and getting back up and then succeeding." The plotline of the team's season wasn't much different from that of junior setter Kaitlyn Fisher, 20, whose first year in college was filled with hardship and doubt. The confidence she gained as an athlete and the emotional support of her teammates, however, got her through tough times, she said. "Being the underdog is a comfortable situation for me because I love to surprise people who aren't expecting you to do well," said the Stevenson College anthropology major with a language studies minor. "It not only shows them what you're capable of but it also proves to yourself you can achieve so much more." Fisher came to UCSC from Huntington Beach with a background in high school and club volleyball. Her mother, a single parent, was a teacher, and they had struggled financially but Fisher said she wasn't prepared when they lost the family home during her first year at UCSC. "I was carrying that weight, that maybe I shouldn't be playing volleyball and having a great time here," Fisher said. "I thought I should be home working and not taking out loans." But volleyball, along with her teammates, had taught Fisher about believing in herself, about working to overcome failure, and getting support. 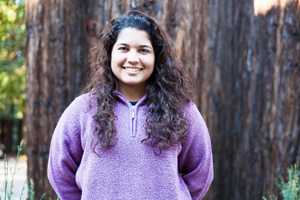 Fisher rallied herself, and with the help of UCSC's Financial Aid Office, she was able to land two part-time jobs and win a $500 Student Services scholarship. "Our coach really helped me believe in my capabilities. Not just as a volleyball player but as a person," she said. Dark-haired, with an air of quiet enthusiasm, Fisher is the team's setter, a position not unlike the quarterback in football. Those who know her say she is always one of the first to arrive for practice and the last to leave. They call her "tough but sensitive." "Kaitlyn is not the tallest girl in the world. She's not the fastest. But she is, essentially, the heart of the team along with a couple of other girls," Combs said. "She's very selfless and works extremely hard." For her part, Fisher said it was the camaraderie of teammates along with lessons of hard work, confidence, and acceptance that has highlighted her educational experience at UCSC. "At the beginning of the season, our coach would say we were warriors," Fisher said. "But halfway through he changed that to 'protectors.' He said we weren't the ones to start the fight. We were protectors who cared so much about each other and the program, that when somebody came after us we were going to protect each other through thick and thin."